Let's face it : this forum is dedicated to uncover the 'best kept secrets' of this planet, so let's give this most crucial matter of our times some scrutiny. The quoted text below is what Piper, our newly registered member (-welcome!-), expounded in another discussion of this forum. I thought it very much deserved its own thread - so here it is. I discount the existence of "nuclear" bombs as a fear-mongering "Sword of Damocles"-type illusion that has now successfully kept billions of people living in fear of nuclear annihilation for 65 years. 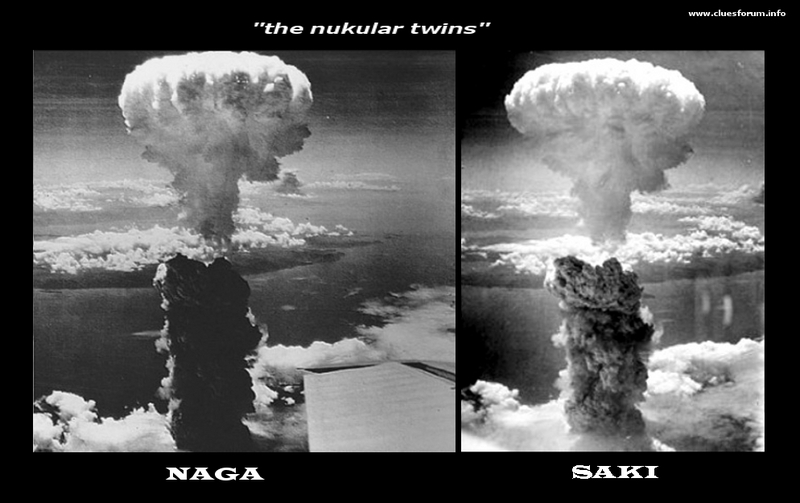 This is based on the improbability behind the science of the explosive device and the alleged mechanism that powered it, as well as the obviously forged videos and the high propaganda value behind the idea, since the firebombing of Hiroshima and Nagasaki served to kick off the fake "cold war" and the fabricated "arms race", which featured both the US and Russia pocketing billions in their taxpayers' money for the manufacturing of these fake "nukes" and, some years later, for the "disarming" of same fake "nukes". Of course, one of them must be fake. Or perhaps - uh...- could both be? To those unfamiliar with photo-analyses: Note that the background in the pictures has evidently moved - meaning the 2 shots (if real) must have been snapped at different moments in time(as the airplane moved along). Now, look at the mushroom cloud in the foreground: It is identical in shape. Enough said? Or are you willing to believe that the mushroom cloud's shape remained static between the two shots? Or that the two shots were captured by two photographers - from two different airplanes - at the exact same moment in time? Good luck with your beliefs. antipodean 4 Nov 28 2009, 11:27 PM wrote: Having personally met the family of a geoligist, who was one of 4 that later worked within the fallout zone, all of whom later died of cancers contracted there. I do not doubt some powerful explosives were tested, some of which could have even contained radioactive materials (aka "dirty bombs"), but it would be a false assumption that only "nuclear" explosions can cause mushroom clouds, so those tests need not have been anything other than large incendiary devices. While I do have doubts as to the real causes of cancer being known, the point is that what I discount is the "nuclear" aspect of said bombs, the science behind them and the great fears of annihilation these ideas bring up in people, as opposed to normal explosives. To those of us who live along the borders of the Columbia River and its dangerous elephant in the room (The Hanford Nuclear Reservation) we place a lot of belief in that our government built and tested many bombs from materials produced since 1944 from that site. From the waste that still pours into the Columbia River present day, we can only assume that the terrible offerings of Hanford were used in not just “Fat Man” and “Little Boy” but also for a lot of other nuclear testing done since then, but the side effects are still affecting millions of people here in the NW. By 1960 more curies of radioactivity had been dumped or leached into the Columbia River than that of the Chernobyl nuclear plant. It is estimated that over 444 billion gallons of radioactive and chemical waste have been discharged into the soil with over hundreds of billion of contaminated waste water discharged into the River itself. About 180 square miles of contaminated ground remains as a public health hazard. Of concern to us is strontium-90, cesium-137, tritium, uranium, technetium, Cobalt-60, Chromium, Chloroform, Cyanide, Carbon-14, iodine-129, plutonium, americium and other toxic leftovers. If in the future, it is shown that the whole nuclear arms race and bomb building was a strawman exercise, we are still left with the after effects of a stupid cold war then. Be careful when attempting to describe a “dirty bomb” as something added to an explosive, all nuclear testing leaves “dirty” after effects. Thank you very much for the welcome Simon, and for starting this thread. I loved your contribution! If we are to learn to easily see through the fabrications from which a large part of the general knowledge base is composed, it is best to expose as many of those fabrications as we can. This section of the forum is important because 9/11 was but one in a long line of such scams pushed by the media onto an unquestioning public. I recently posted a list of what I believe to be the top-10 "most widely accepted and perpetrated lies in human history" in a discussion thread on another forum, and while I placed the Apollo Moon hoax and #6 and the existence of hijackers and planes used on 9/11 at #4, the topic currently under discussion came in at #2 because of its widespread belief, its effect on the human psyche and on world politics, and the length of time the lie has been in place. There are so many lies that make up what we call history, a.k.a. the Scaliger-Petavius (mainstream) textbook version of history that is taught in our schools, that it is what stood in the #1 position on my list - yes, the biggest lie in history is history itself. That really deserves a thread of its own, perhaps some other time. After seeing that 9/11 was a total lie and then researching the Moon hoax, the Electric Universe theory, the Zapruder film tampering, the lies in history, the lies in science, lies in medicine, etc. I was ready to question all of my beliefs, which is what I started doing. - Do you understand the science behind a nuclear explosion? Do you understand the mechanism that triggers the explosion? Do you understand E=mc^2? What does it mean to square a speed? Do you believe in Einstein's relativity? Do you believe in the current model of the atom? Do you believe that only nuclear bombs can create mushroom clouds? - Could Hiroshima and Nagasaki have been firebombed like Dresden and Tokyo were? Could you visually discern between victims of firebombings and radiation burns? Could the various videos of nuclear tests be propaganda? Could 1940s and 1950s effects technology create believable nuclear explosions for the newsreels? - What about the war, do you believe 'the bomb' was necessary? Some say the Japanese had already capitulated. Do you believe in the 'cold war' and that the Americans and Soviets were dangerously poised on the verge of nuclear annihilation? Do you believe in a beneficial government? A transparent government? Do you have faith in the military-industrial complex that Eisenhower later warned people about? - What about money? The money spent (pocketed) on the Moon hoax is minimal when compared with the billions in taxpayer money spent on the nuclear "arms race", in both the U.S. and the U.S.S.R., for the construction of these expensive but never utilized weapons of mass destruction. And of course years later for the "disarming" of these same weapons. Note that I am referring to nuclear bombs here, as I do believe that nuclear reactors probably exist since they are based on a completely different technology, which is that of radioactive materials heating up water -> creating steam -> spinning turbines -> generating electricity. - Have you ever wondered why no rogue group of terrorists or any nation other than the most powerful have been able to build their own atomic bombs if it was possible to build them with technology from 65 years ago? Are their scientists and researchers that dumb? Are they missing some magic ingredient that is only available to chartered members of the elite "nuclear club"? Perhaps that ingredient is the power of their media to back up their lies? If we go back to the pre-Hiroshima nuke propaganda, we find talk of areas being urned into a glass parking lot where no life would be able to grow for the next 500 years. This obviously did not happen! Here are a few photos comparing the aftermath of a firebombing of Tokyo and the aftermath of the nuclear bombing of Hiroshima. Are they very different other than that of the larger Tokyo having more surviving buildings? Is it possible that Hiroshima and Nagasaki were chosen as targets for this deception instead of a more strategic target like Tokyo because they were mainly filled with cheap light paper-thin wooden structures, thereby making the devastation of the firestorm appear more complete? Should any buildings, bridges and trees have been left standing after a nuclear devastation? Where is this glass parking lot? What about the nuclear "shadows" allegedly burned in behind objects and victims? Do the following shadow effect photographs seem realistic? I look forward to all comments, thoughts, photo comparisons or any other contribution to what I consider to be another very important historical part of the mass manipulation that has taken hold of our society. An interesting thread addition and a subject that I suspect few of us have researched. I notice the 77 on the B-29. Where have I seen that number before? Intersting stuff. A country like Iran becomes demonised, because people are brainwashed into believing that a capability to produce nuclear energy = a capability to produce 'the nuclear bomb'. Maybe there really is nothing to fear, except fear itself. It sure deserves a thread of its own so I started one and thanks for pointing in this direction cos I think the time has come to start to look into the education system and the history books. (Admins message: Something inexplicable happened as we transferred some relevant posts from the moon hoax thread over to this one. We are sorry for this mishap - the 3000+ viewcount of this thread is in fact that of the old moon hoax thread). Piper, thanks for developing this interesting topic which you have proposed. terence.drew 4 Nov 30 2009, 02:15 PM wrote: I think they deserve a mention at the annual Reality Shack gala dinner! Yes - those fellows will be invited for sure! I heard that all the nuclear bomb footage passed through some editing studio embroiled in the "Laurel Canyon scene" ... is this true? If so, it would be darn strange that Kubrick is implicated in both the Apollo moon hoax AND the scene in Doctor Strangelove at the end, when - (sorry for spoilers if you haven't seen the movie) - every bomb footage ever made seems to go off at once as a conclusion. hoi.polloi 4 Dec 3 2009, 11:57 AM wrote: I heard that all the nuclear bomb footage passed through some editing studio embroiled in the "Laurel Canyon scene" ... is this true? Yes, apparently there was a clandestine film studio in Laurel Canyon. To be more precise it was on Lookout Mountain (Overlook?). I remember reading about a hotel that burned down in 1910 or something. The kids were playing with matches - so I corrected them too!! OH! You changed the wiki article, good man. Since we are censored on that place in every other regard, our only hope for people seeking truth is to give them clues where it is "allowed" by the wikinazis. hoi.polloi 4 Dec 3 2009, 12:12 PM wrote: OH! You changed the wiki article, good man. Since we are censored on that place in every other regard, our only hope for people seeking truth is to give them clues where it is "allowed" by the wikinazis. Huh? Me no change wiki! So we have discussed the ability for the perps to completely fake the footage and photos of nuclear bomb explosions, but now we must answer other questions. But the joke's on me if my science is just so horrible that all I can come up with is the above. I vote for real nukes; they can be built and do work. It should be easy ... to check? and I don't argue any on the videos. this topic, and then I have a list we can go through.